Description: The house consists of 80 sqm of living space with 2 bedrooms, a living area, fitted bathroom, toilet and large entrance hallway. The house also has a cellar room, TV, Internet. 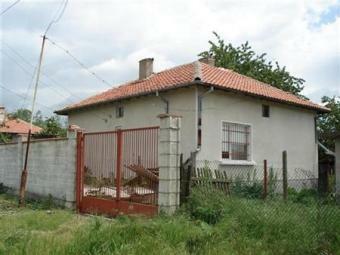 The plot is 1320 sqm with fruit trees ,grape vines, has large structurally sound outside building and gated drive way. Located on the main road from Dobrich to Albena Resort, the village is very well developed and offers plenty of amenities such a few shops, bars, a bakery, Post Office, Village Hall, a school and a regular transport to the nearest settlements. Dobrich Town is only 6 km away which is close enough for you to go shopping there! The popular tourist centre of Albena is 26 km, the coastal town of Balchik is 38 km and Varna International Airport is 58 km!